It’s time to channel your inner Indiana Jones with this incredible slot developed by NetEnt. Lost Relics promises to take you on an exciting archaeological quest, searching for ancient artifacts and potentially massive wins. The game has all the potential to offer a cracking good time, but does it actually match the hype? 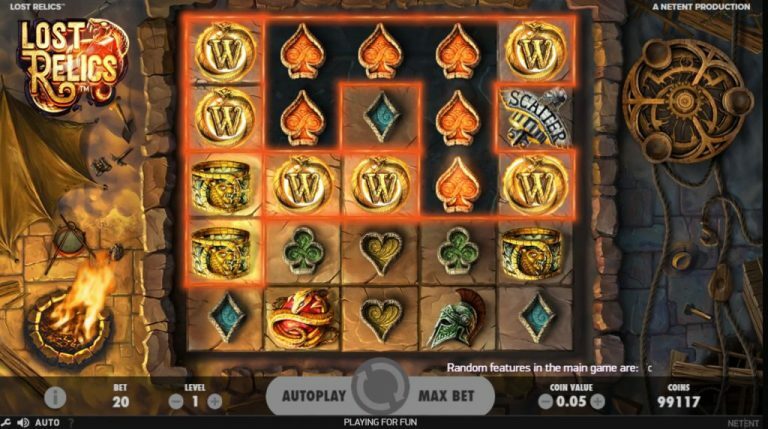 Lost Relics is a NetEnt online slot game and is played on a 5-reels and 5-row layout, using the NetEnt Cluster Pays system. The Cluster Pays system works by paying for clusters of symbols and not the traditional paylines. In essence, 6 matching symbols that are adjacent to each other both horizontally and vertically, can make up a cluster. You can also have multiple clusters, but each cluster pays separately according to the paytable. Playing this slot is simple – all you have to do is set the coin value and the bet level and hit the spin button. This slot is packed with surprise and anticipation due the variety of features that can occur randomly. The random features in the main game can occur after a winning combination but before the wins are paid. Up to 5 instances of 3 random features can occur, being the Coin Win, Extra Scatter and Extra Wild features. Coin Win: When the Coin Win feature activates, one symbol from a winning combination awards you a coin win between 3x and 30x your wager. The symbol which awards the Coin Win remains part of your winning cluster. Extra Scatter: When this feature is activated, one of the symbols landed within a winning combination will award you an additional scatter symbol. What’s more, the symbol that awards the bonus scatter, still remains as part of your winning cluster. Extra Wild: When activated, the Extra Wild feature gives you three wild symbols placed at random positions within the reels where there are no winning clusters, scatters or other wilds. This feature can give you up to 15 wilds in total. Three extra wilds, depending on their position, could even activate another feature. As you can imagine, with so many extra wilds on the reels, the potential for huge clusters and wins is possible. With its archaeological theme, it is hardly surprising that the game’s symbols consist of a collection of treasured artifacts. They include a snake wrapped around a red ruby, an antique bracelet, a gladiator helmet and a dagger, as the high value symbols. The lower value symbols are jewels in the shape of hearts, clubs, diamonds and spades. The 2 highest-paying symbols, being the ruby with a snake and the bracelet, both pay 6,000x your wager if you land a cluster of 25 of a kind. Now that’s the kind of payouts we like to see! If you get 3 scatter symbols in a spin during the base game, you are rewarded with 10 free spins. The scatter symbols in the Lost Relics slot can appear at any position on the reels 1, 3 or 5. Although Lost Relics does not have a fixed jackpot or a progressive jackpot, taking a look at the paytable reveals that you can win some serious amounts of cash, plus add in the extra features, and Lost Relics has the potential for even bigger payouts than most slots out there. As mentioned earlier, Lost Relics does not use paylines but rather the NetEnt Cluster Pays system. The theoretical return to player percentage for the Lost Relics slot, as advertised by the developer, is 96.3%. As a medium volatility slot, you can expect a good combination of wins and features. 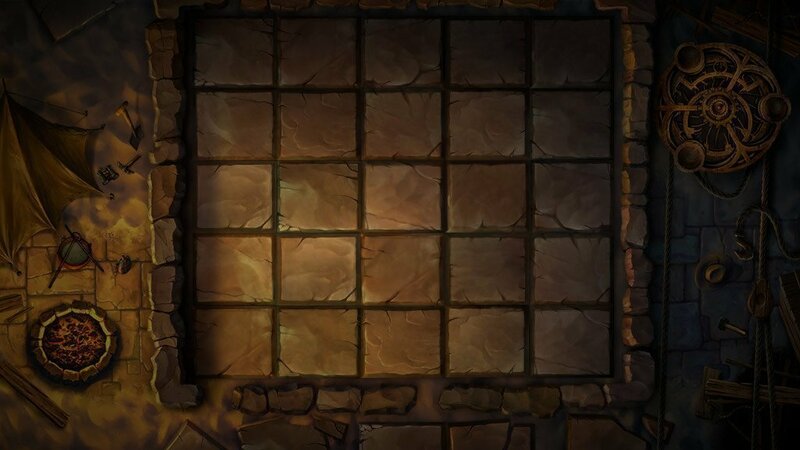 As soon as you start to play Lost Relics, it quickly becomes clear that NetEnt has put a lot of thought and effort into the design and gameplay of this slot. The graphics are excellent with a lot of attention to detail and the animations, with the well-matched soundtrack, definitely adds to the excitement. All the random features within the main game add a real element of surprise as you don’t know what and when a feature will appear. While the theme of the game is nothing new and has been exhausted by almost all game developers, NetEnt have found a way to refresh the concept. The fact that you can win some seriously big payouts is a huge drawcard, but you are probably going to need to spin the reels a fair amount of time till you hit a big one.